McMenamins partners with the Troutdale Historical Society to host a speaker every month. This event will be held at the Blackberry Hall at McMenamins Edgefield. 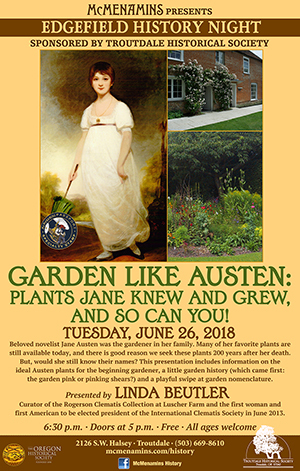 Linda, our curator, will be presenting “Garden Like Austin”. Here is a link to this series https://www.mcmenamins.com/History . Plants may be available for purchase.